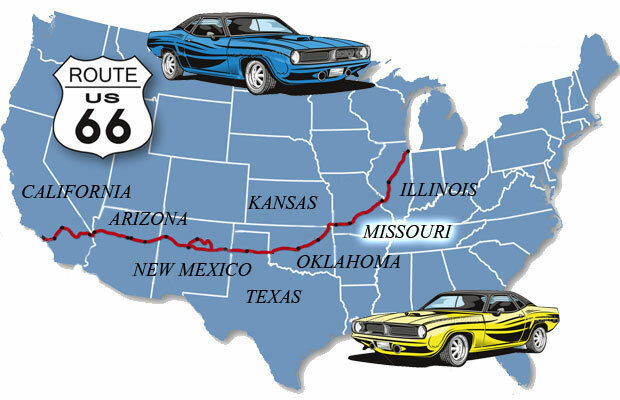 The second state on Route 66 is “The Show-Me State”. It’s not exactly known where or how this nickname came from, but its real name derives from the Missouri River, which was named after the indigenous Missouri Indians. Missouri was also the starting point of the famous Pony Express which was a horseback mail service delivering messages and mail from St. Joseph, Missouri across the Great Plains, over the Rocky Mountains, Sierra Nevada, all the way to Sacramento in California. Hundreds of conservation and natural areas, 52 state parks, the Ozark Mountains, scenic river-ways and America’s longest rail-to-trail hiking/biking trail. All these make this state another big playground for the outdoor enthusiasts. Gary Turner’s Gay Sinclair Station : Location – Paris Springs. It is a must stop, follow old Route 66, just west of Springfield. Garry will teleport you into the past. The Gateway Arch in St. Louis: Location – St. Luis. Construction on the shores of Mississippi which symbolizes the gateway to the mythical American Midwest. The Route 66 Museum: Location – Eureka. Route 66’s layout in Missouri and its major attractions: photos, objects etc. Ghost sign of Diamonds Restaurant: Location – Villa Ridge. Once the largest road restaurant in the world. The Wagon Wheel Motel: Location – Cuba. Famous tourist court or motor short in the heyday of the 66. The Munger Moss Motel : Location – Lebanon. Motel has been in service on Route 66 since 1946. The Drive-In Theatre in Carthage : Location – Carthage. One of the most beautiful and best restored outdoors movie theatre on Route 66, dating from 1940. Meramec State Park: Distance – 10 miles, 20 min from Sullivan, MO. Within the park flows the Meramec River surrounded by steep forested hills coverd by various hard-woods and limestone outcroppings. Attractions – Climbing, Hiking, Picnicking, Boating & Fishing, Caving. Elephant Rocks State Park: Distance – 60 miles, 1 h 20 min from Sullivan, MO.The appeal of Elephant Rocks State Park, is a train of gigantic pink granite boulders which are set atop a hill, and look just like circus elephants. Attractions – Climbing, Hiking, Picnicking. Johnson Shut-ins State Park: Distance – 75 miles, min from Cuba, MO. Park is set on igneous rock of volcanic ashes and gasses, and is located in the East Fork of Black River. The valley of the park includes an orientation centre, retail stores, picnic areas and shelters. Attractions – Fishing, Black River Swimming , Hiking, Mountain Biking. Ha Ha Tonka State Park: Distance – 45 miles, 1 h from Weynesville, MO. Great architecture and stunning scenery make Ha Ha Tonka one of Missouri’s most treasured spots. Located on the shores of the Lake of the Ozarks, the park features the ruins of a castle built by a Kansas City businessman. Attractions– Boating, Fishing, Camping, Hiking, Biking. Mark Twain National Forrest: Distance – 52 miles, 1 h from Weynesville, MO. It represents 11% of all forested land in Missouri and spans 29 counties. Unique features of the forest include – Glade Top Trail National Scenic Byway, Ozark Trail System Winds and Greer Spring. Attractions – Fishing, Hunting, Hiking, Picnicking. The Ozark Lake, Trail: Distance – 40 miles, 45 min from Lebanon.The Ozark Lake is a large artificial lake created by impounding the Osage River in the northern part of the Ozarks in central Missouri.The lake is also called “The Magic Dragon” for its serpentine shape. Attractions – Boating, Kayaking, Fishing, Camping, Hiking, Swimming, Horse-Riding. Roaring River State Park: (Native American Heritage Park). Distance – 67 miles, 1h 30 min from Springfield, MO. The park can boast one of the best trout fisheries in the whole America. The natural setting of towering hills above a deep blue spring, trails cutting through the parks rugged terrain, and natural camping sites provide a scenic backdrop to adventures. Attractions – Camping, Fishing, Biking, Swimming Hiking.